Last minute Christmas shopping. Words that strike fear into many; yet afflicts so many shoppers at this time of year. A few years back, I would manage to finish my shopping months ahead of time via internet shopping. Yup, I used to scour Redflagdeals and Slickdeals daily to score the best deals. By the time December hit, I was sitting pretty. Being totally consumed by this blog, I totally forget about shopping, let along searching for deals. Therefore, Viv and I had to pay a visit to Metrotown. Now, since we were out, we needed to find a place for a quick bite. Much like the rest of the fall and winter, it has been dreary, rainy and cold. Perfect for something a bit hot and steamy (get your head outta the gutter!). A Taiwanese Korean hot pot restaurant which resides on the outside of Crystal Mall facing Willingdon seem to fit the bill. I know, it sounds strange, but if you can get over the strange fusion of 2 different cuisines, it's alright. As you know, my love for the Crystal Mall parking lot is somewhere between pulling nose hairs and trying to squeeze out a difficult pimple. Therefore, we parked at Metrotown and walked over in the wet and cold. Yup, I'll do that to avoid that lot, otherwise known as parking purgatory. Imagine going around and around, surrounded by people who are clueless about parking with only one way out. If that's not hell, I'm not sure what is! By the time we arrived at Han Ju, it was still early and we were able to nab a seat. Good thing too, a lineup began to build soon after. Why is that you may ask? For starters, the food here is cheap. You can eat well here for under $10.00. In fact, with $5.00 and spare change, you'll have enough. I went for their specialty which is the hot pot. Like any value-loving Chinese person, I selected the Seafood and Tofu Hot Pot. Hidden within the spicy broth was a modest amount of seafood with cellophane noodles. It was mostly broth; yet, I don't expect much for the price I paid. A bit spicy and steaming hot, that hit the spot. Again, nothing spectacular; however, for the price... 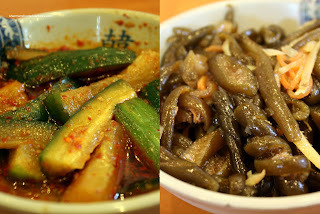 I also added 3 side dishes to my meal: Beef Shank, Seaweed and Marinated Hot Cucumbers. Honestly, I wasn't exactly thrilled with the sides. The beef shank was a bit chewy and not really all that flavourful despite the sauce. The cucumbers were a bit soggy; thus lacking any real crunch. I did like the spiciness of them though. Probably the best of the bunch was the seaweed. It had a nice chewy texture which wasn't too hard to eat. Viv opted for Korean Style BBQ Beef on Rice. The darn thing was huge, with lots of beef, spicy tofu and veggies completely covering the rice. The beef was quite tender and modestly seasoned while the rice was still a bit firm. For $6.95, there's not much to complain about. Like most Taiwanese restaurants, bubble tea was available. Viv decided to try one and it was a bit on the sweet side. The pearls were the right texture bordering on chewy while being soft. Not bad, but it's best to visit an actual BBT place instead. Nothing all that special about the food here really. However, it's definitely more than acceptable. Yah, it's not authentic Korean food and yes, it's mixed in with some Taiwanese. That really didn't bother me in this instance. For the rock bottom prices they charge, I can see myself returning for a quick bite to eat. Oooh, this is my favourite place when I'm in the mood for bulgoki and oily rice. It's a greasy combination that really hits the spot. I always order the beef and kimchi combo. Plus it's easy on the pocketbook and hence cheaper than the korean version (except the Da Rae Oak lunch special prices) and sometimes tastier too. After getting used to driving the UBC parkades, the Crystal Mall parkade doesn't phase me, it's the drivers who have trouble negotiating the tight turns that drives me nuts. It also helps that I have a small car. Yah, a good deal for sure. Haha... UBC parkades... I hate those too! I have an SUV, very difficult to park when the moron next to you cannot negotiate a dividing line. My best memory here was when we dared our friend to finish a kimchi bowl by himself. If he did, one of us would pay for it. Thing is, he can't eat spicy, just the smell of it will make him sweat. Oh and we didn't allow him to drink water until he finished it. Oh that was great..he was dripping sweat from his nose into his bowl...rofl. That's hilarious. What people would do for money. Once, we dared a friend to eat a whole bowl of wasasbi at the Eatery for $20. He did, but didn't look all that well after! Oh but a free meal, so difficult to pass up! He even tried the spiciest wings from WingNuts too...well actually, he licked the sauce and couldnt take anymore.